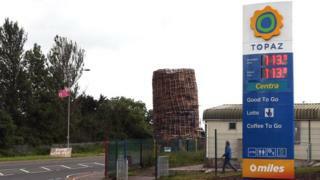 A towering bonfire has been built across the road from a County Antrim petrol station. The bonfire, made of wooden pallets, has been built on a grass verge at Prince Andrew Way in Carrickfergus. The NI Fire and Rescue Service said it was working with the local community "to provide safety advice in relation to the Castlemara bonfire". The bonfire, estimated to be about 50ft (15m) tall, is roughly twice the height of a two-storey house. Bonfires are traditionally lit in loyalist areas of Northern Ireland on the eve of the annual 12 July celebrations marking King William III's victory at the Battle of the Boyne in 1690. The council-led Mid and East Antrim Bonfire Liaison Group has also been involved in talks about the bonfire, concerns about which were first reported by the Irish News. Assistant Chief Fire Officer Alan Walmsley advised bonfire builders to keep the structures "at a manageable size and sited in a clear, open space at a safe distance from buildings and overhead cables". "A bonfire should be a minimum distance of five times its height from property," he said. "It should not contain any potentially hazardous materials or tyres and never use flammable liquids such as petrol or paraffin as these can produce explosive vapours." Ch Insp Stephen Humphries said the police would work closely with partner agencies and local communities to address concerns linked to bonfires. "Constructive dialogue and engagement involving the community, politicians, public bodies and police is the approach most likely to result in workable solutions on bonfire issues," he said.